When I woke up at 5 this morning and couldn’t go back to sleep, I wondered if it was a bad omen for the day. Trying to think positively, I figured I could be super-productive. Bread-making was on my list today. I always have the best intentions about homemade bread but it seems that I never make it unless I am completely out so I’ve deliberately left bread off my list for the last 2 shopping trips. Being in dire circumstances, I was pressed into making bread today, bad karma or not. 1. 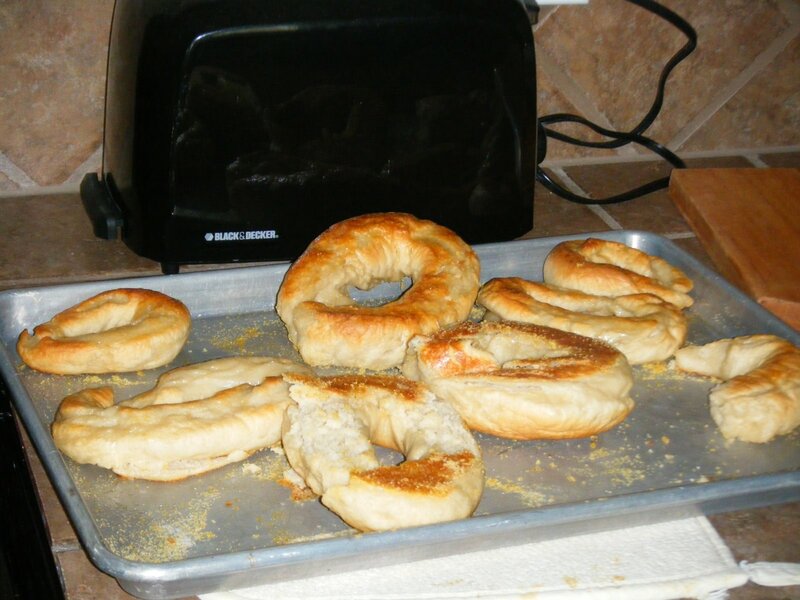 Just like most things made from dough, bagels increase in size as they boil AND bake so you should not start them at full size unless you want mammoth bagels (see above). 2. It is important to completely seal the two ends that you attach to make the circle-otherwise you have half a bagel (see above). 3. There must be some secret to the fancy cornmeal that professionals use…it just made the bottoms of my bagels stay firmly adhered to the pan (see above mangled center bagel). 4. Even if your bagels look horrible they can still be edible with some butter and jam. And since I didn’t buy any bread while I was at Walmart, it was back to square one with the dough. Hopefully we’ll get bread this time. thats funny! but props for trying and not giving up!!! I bet they still tasted yummy!! I hope your next batch turns out!! Adventures in breadmaking, you just never know where they’ll lead! I would have loved one of those nice warm bagels no matter how they looked. Way to be resourceful! haha, i have tried at least three times to make bread for poor nathan, and it never works out. i’m a bread-making loser. but those bagels sure look good! Does everyone realize I am being completely sarcastic about those pathtetic bagels? If you enlarge the picture you notice that they hardly look edible! Just wanted to make sure my intent was clear: My bread efforts were a wreck. Lindsay, you are too funny. Bread is tricky, I totally agree. Oh my! Oh my! I wonder just recipe you are using that takes that long to make bread. My recipe, when doubled, makes 8 loaves and they can be done, start to finish, in 3-4 hours. It might not be the best homemade bread in the world, but it always seems to go. Happy to see that you found some use for your dough! 🙂 Don’t give up! Just keep trying! Love you! Um, Grama, I’m sorry to say, that WAS your recipe…hence the problems i had when I let it go WAY TOO LONG. However, my next try turned out so perfectly you’d be proud. petunia! I am so thankful for the great tips! I will use them when I venture to make yummy bagels with butter and jam. Good try! They still looked good though – nice golden brown, etc. Do you remember the first time I had you help me make rolls here at my house? They were good, but the size of a walnut!! This was hilarious! I’m still cracking up over here. Hey, at least you tried! That’s better than most of us.love ya girl! I’m through trying to make bread. It always turns out too dense. But like you said, nothing that a little butter and jam can’t fix.